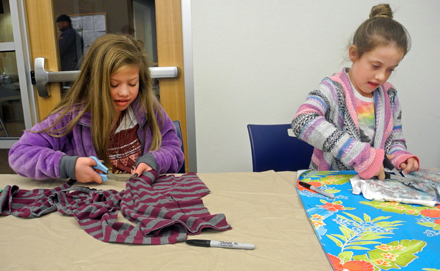 Above, cousins Kiara Kennemur and Katie Hesser cut recycled t-shirts in order to create Mohawk hats during the Artesia Historical Museum and Artesia Public Library’s final Recycled Workshop Tuesday at the library. 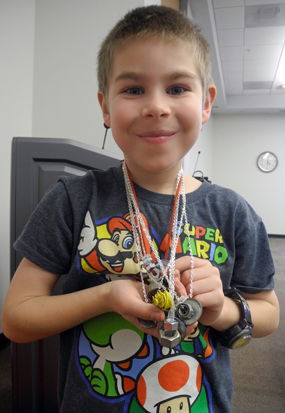 At right, Alex Gunter shows off the multitude of necklaces he fashioned out of an array of hardware parts during the event. The series of workshops were held in order to draw attention to the concept of repurposing and allow Artesians to create new and unique items from things that would otherwise have been wasted.